From April 16 to 20, we’re celebrating National Volunteer Week! We’re so thankful for our MDA volunteers who give of their time and talents to help families with muscular dystrophy, ALS and related diseases. If you’re an MDA volunteer, consider this your virtual hug from us! If you’d like to become a volunteer, we’d love to meet you. Each day this week we’ll be sharing the story of one of our amazing volunteers. Today, meet Patty Dietering. 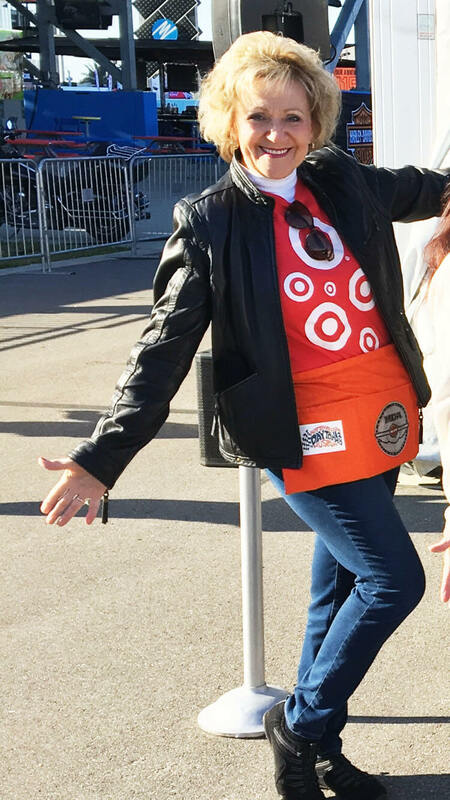 In March, as Daytona Bike Week 2018 neared, Patty Dietering, human resource executive team leader for the Port Orange, Fla., Target, gathered her teams. Their mission: partner with MDA and Harley-Davidson Motor Co. to raise awareness of MDA and fundraise to continue the fight to end muscular dystrophy, ALS and related life-threatening diseases. Patty manages all volunteer activity for her Target store; in 2017, her team contributed 2,218 hours of volunteer service toward multiple agencies. For Daytona Bike Week, Patty rallied more than 35 employees from her own and two other Daytona-area Targets to staff a Harley-Davidson booth at the event and collect donations in exchange for special MDA/Harley pins, plus raffle tickets to win a Harley-Davidson 2018 Street Glide motorcycle. And while this was the first year Target partnered with MDA, it won’t be the last. Patty and her store are planning to participate annually in Daytona Bike Week on behalf of MDA. Learn more about volunteering with MDA!